Unfortunately I’ve not got many snaps of what’s been happening at Number 18 from last week. Progress has been made, but most of it is covered in cardboard! I’m hoping I’ll have more to show by the weekend. The tiler worked at the casa all of last week and the downstairs shower room is nearly done. So are the kitchen and utility floors, apparently they’ll be grouted this week. Once the rooms are cleared of tools and other bits, I’ll gather up the cardboard that’s protecting the tiles and take some pics. As we’re very close to ordering the kitchen, we went to our new local Wren store on Saturday. I wanted to check out what was on offer before committing to the kitchen I’ve been looking at. I was rather impressed with the Linda Barker range, the lilac and terracotta gloss doors in particular are really dreamy. The range is, however, quite a bit more than the Halvanto kitchen I’ve been looking at and I think we’ll be sticking with it. 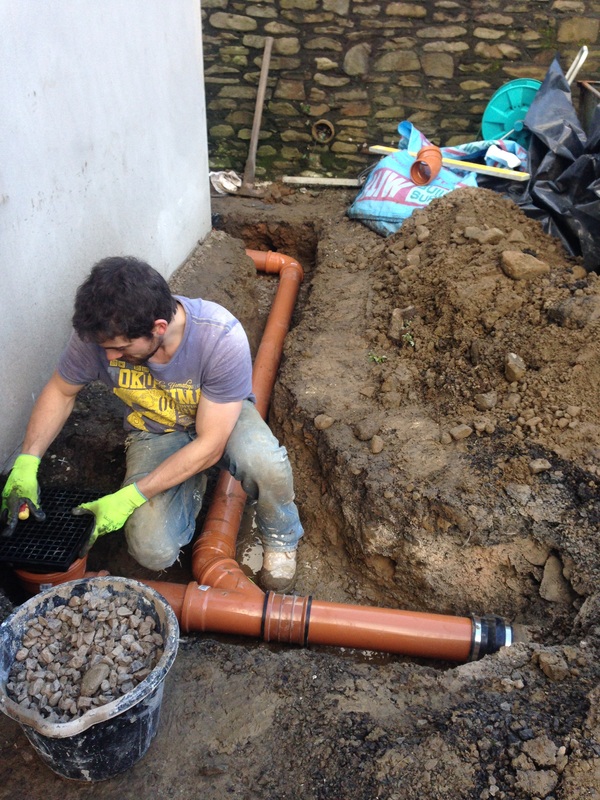 Yesterday, Dan dug a trench to put in new drains and drainage pipe work for surface water. My sister and I helped a little. When I say we helped, she shovelled some stones into a bucket and I did even less by merely holding the pipe work for all of thirty seconds. We were probably more of a hindrance to be honest, and as soon as we’d seen the last bit of pipe slotted into place we toddled off home for a cuppa. That was when my sister decided to get out of the wheel barrow… Don’t ask.